One team snapped a losing streak and the other started one in Severn Friday afternoon as No. 2 ranked Archbishop Spalding’s Josh Moylan answered the call from his coach to “show more leadership” to get the Cavaliers back on track. Moylan, a senior first baseman/pitcher and an East Carolina University commit, went 4-for-4 with three doubles and three RBI and pitched two scoreless innings as the host Cavaliers snapped a three-game losing streak in the MIAA A Conference with an 8-2 victory over No. 9 Gilman School. It was Gilman’s second consecutive conference loss (10-6 overall, 5-2 MIAA A) in two days, having dropped an 8-5 decision to streaking No. 20 Mount St. Joseph on Thursday. The latter Gaels dealt Spalding a 3-0 loss on Tuesday as senior John Torroella tossed a no-hitter. Spalding (7-4, 3-3 MIAA A) )also lost on Thursday by 15-11 to McDonogh School as the Eagles’ big bopper, Kyle Whitaker, unloaded three dingers. Cavaliers coach Joe Palumbo had a man-to-man talk with Moylan after the loss. Obviously the 6-foot-4, 225-pounder took it to heart and came out Friday on fire. 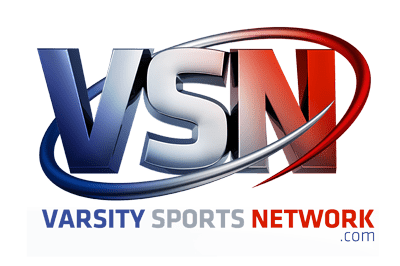 Junior righthander, Nate Vermillion, another 6-foot-4 beast, started for the Cavaliers and went five innings only giving up the two runs and four hits – three of them doubles by the Greyhounds’ Tripp Myers, Tim McCambridge and Pierce Bennett. Vermillion struck out seven, walked three and hit a batter on 97 pitches. Moylan then capped it off with two scoreless innings, not yielding a hit, striking out three and walking one. McCambridge led off the game with a two-bagger to left and later scored on Bennett’s sac-fly to center, but in its initial at-bat, the Cavs’ leadoff batter, Justin Caesar also doubled and scored. Moylan singled Caesar in to tie it one and Cory Blohm’s sac-fly to give the Cavaliers a 2-1 lead after an inning. Gilman’s Tyler Martinez homered in the second to tie the game at 2-2, but the Hounds fortunes were short lived. With the way Vermillion was pitching and Moylan and mates were swinging their bats, the four-run second inning that followed pretty much put the game away. Moylan drilled his first double in the second scoring a pair after Alex Green’s first of two singles and Caesar’s fielder’s choice had scored runs. The Cavaliers added to their 6-2 lead with single runs in the fourth and sixth innings. An unearned run made it 7-2 and Blohm’s second RBI on a fielder’s choice capped the scoring in the sixth. 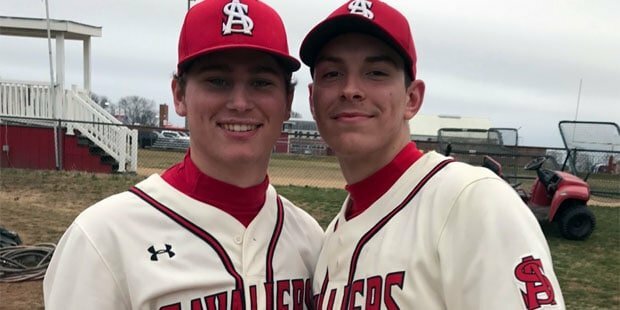 Spalding finished with six doubles in their 10-hit attack – Moylan had three of the two-baggers and Caesar one as mentioned with Al Barclay, who scored three times and Ethan McCormick hitting the others. Playing an 18-game schedule, six teams will qualify for the MIAA A Conference Tournament that decides the league championship. The 10-team circuit is approaching the halfway mark with No. 4 Calvert Hall College (11-2, 6-0) leading followed by St. Joe (7-2, 5-1), Gilman (10-6, 5-2), McDonogh (6-5, 3-2), Spalding (7-4, 3-3) and No. 5 John Carroll (8-2, 2-2). Those are the six teams at this point with winning or .500 records. Defending champion, No.6 Archbishop Curley has slipped to 4-5 and 3-4. Pictured above: Josh Moylan (right) went 4-for-4 with three doubles and three RBI’s and combined on the bump with Nate Vermillion as No. 2 Archbishop Spalding snapped a three-game losing streak with an 8-2 victory over No. 9 Gilman School on Friday in Severn. 2B: Gilman — Tim McCambridge, Tripp Myers and Pierce Bennett; Spalding — Justin Caesar, Al Barclay, Josh Moylan (3) and Ethan McCormick .